I started recently watching this documentary called “Why do We Talk?”. I have yet to finish the entire film, but it focuses on the unique human ability to use words to speak. It says “other animals may use sounds to communicate, but we’re the only ones on the planet, who can talk”. In fact, we’re so hard-wired to use words to express ourselves that it seems we do so regardless of whether or not our words are falling on a willing or able audience. This is one of the biggest problems in a dog training classroom. I’ve seen it a hundred times. A desperate student standing over his dog, repeating-with increasing volume-the word “sit”. The more he says it, the more frustrated he becomes and consequently, the more bewildered the poor dog becomes. It’s almost as though, by speaking, he feels he has some element of control over the situation. 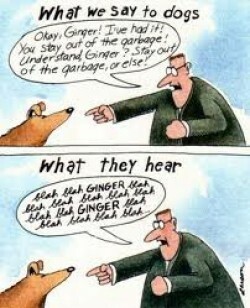 Unfortunately, for dogs, all the talking seems to have the reverse effect. In terms of training, it seems to me that the less talking, the better. Whenever we teach a new cue to a dog, we don’t introduce the verbal cue right away. First, we show the dog what we want (either through a lure, through shaping, or through capturing) and we reward the dog. When they start to anticipate and offer it on their own, THEN we add a verbal cue. In my experience anyway, dogs are much more visual. It seems that they pick up on the subtlest cues in our body language (perhaps from thousands of years spent as hunting partners and companions). So while you may THINK that your dog can understand when you’re chirping away about your plans for the weekend, he is in fact, responding mostly to your physical cues. We look distinctly different when we’re happy (smiling, loose body posture and relaxed voice) than when we’re angry (frowning, stiff and furrowed brow). Dogs become aware of when they’re more likely to be rewarded based on those cues and they learn to associate that happy, chirping voice with love and good times. This explains why I’ve always been a fan of “default” behaviours. Here is a video from Emily Larham of Kikopup “capturing” calm behaviour in her dog. http://www.youtube.com/watch?v=wesm2OpE_2c. The idea is that, rather than constantly, and frantically, begging your dog to lie down or go to his bed, you just wait. Wait some more. As soon as he lies down and looks away from you, voila! He gets rewarded. There are so many situations where this technique can be applied and even across different behaviours. In our Next Steps class, for example, we teach an “automatic sit”. This one comes from Sophia Yin. Just stand with a treat pouch and your dog on-leash and cross your arms. As soon as your dog sits, say “yes” (or click) and reward. Within no time you’ll have a dog that sits every time you cross your arms! This works wonders around little kids because it’s something they can easily do. As a general rule of thumb I find that if your dog is really excited, jumpy and “hopped up on goofballs“, any kind of talking just fuels the fire. While you may think that constantly asking your dog to get off or sit down is helping, it is in fact, just making him more excited. If you can just sit back and patiently wait, your dog will eventually get the picture that he’s more likely to get what he wants by offering something YOU want. Is this starting to make sense? So before you start sounding like a broken record and driving your dog trainer crazy just take Elvis’s advice: A little less conversation, a little more action.